Minimum quantity for "24 piece tray jigsaw puzzle" is 100. Develop a sense of belonging – use tray jigsaw puzzles as a symbol of being part of a project. These are excellent materials for charity, as you can resell tray jigsaw puzzles and accumulate revenue for charity purposes. Information can be printed on both sides of a tray jigsaw puzzle to explain the aims of the charity. 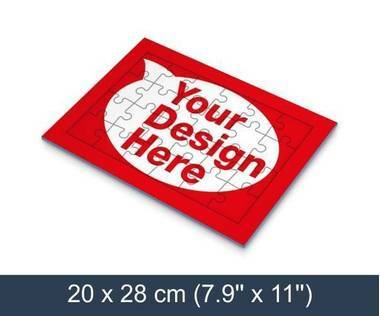 Use promotional jigsaw puzzles to raise funding for projects or products. Turn your crowdfunding activities into a memorable experience for your supporters – award them with high-quality tray jigsaw puzzles! VERY quick delivery, print is in a good quality.